Using their new modeling framework, Professor Dionisios Vlachos and his team from the University of Delaware are fundamentally changing how scientists create catalysts. Instead of synthesizing a material and then analyzing it, Vlachos and his team are determining what the reaction demands and then building a catalyst to fill that role. Vlachos shared his results and insights at the Pacific Northwest National Laboratory's Frontiers in Catalysis Science and Engineering Seminar. This seminar, part of a series, features academic and other leaders in catalytic research and development. 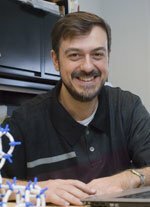 "Combining this framework with chemical intuition cuts dramatically the time needed for computations and offers predictions that agree well with experiment," said Dr. Sotiris Xantheas, a theoretical chemist at PNNL who attended the talk and spoke with Vlachos at length afterwards. The framework or hierarchical multiscale modeling is a key part of the research being done at the University of Delaware. The modeling allows scientists to examine catalysts at different scales, from atomic interactions up to kinetics and through heat and mass transfer of chemical reactors. It allows successive approximations to be conducted, iterating on materials and reactions based on different parameters. "Vlachos showed—using this framework—how phenomena at various time and lengths scales have different influences on catalysis," said Dr. Roger Rousseau, a catalysis scientists working on PNNL's Center for Molecular Electrocatalysis. With this model, the Delaware team is developing detailed reaction mechanisms, insights into reaction chemistry, uncertainty quantification, and creates links among synthesis, structure, and properties. Of particular note is the work Vlachos is leading at the Energy Frontier Research Center on biomass conversion and how the size and shape of catalysts effect the reactions they are driving. "The University of Delaware, one of the leading catalysis programs in the country, is pursuing novel approaches to these complex systems," said Dr. Bruce Garrett, Director of the Chemical & Materials Sciences Division at PNNL. "This talk was a great opportunity to share information and ideas." More about Dionisios Vlachos: He is an internationally recognized catalysis researcher with an extensive list of honors and approximately 180 refereed journal articles to his name. He is the Director of the Center for Catalytic Science and Technology and the Elizabeth Inez Kelley Professor at the University of Delaware. In addition, he leads the Catalysis Center for Energy Innovation and the University of Delaware Energy Frontier Research Center, focusing on the development of innovative catalytic technologies to efficiently convert trees, grasses, and other biomass into chemicals, electricity, and fuels.